Welcome to the Greenfield Public Schools! about Teacher Appreciation Week - Nominate a teacher! about Recorder: "The Joy of strikeouts"
In 2017-2018, the Academy of Early Learning will celebrate its 11th year! Our theme-based K-5 elementary schools boast gardening & sustainability; community connections; and Extended Learning Time. We offer an accelerated Math & Science Academy, housed at the Greenfield Middle School, and an innovative college partnership with Greenfield Community College on the GHS campus! Explore the "Schools" link to learn more! In addition, we offer social-emotional programs like Responsive Classroom and mindfulness, and have forged a consulting partnership with the New England Center for Children, an internationally recognized program, to enhance and vertically align our specialized services for children with autism from preschool to high school. Greenfield Public Schools recognizes the value of our expert teachers and an engaging, academically rigorous curriculum. We celebrate a thriving arts and music program, with GHS (newly renovated and LEED Gold Certified in 2015), being recognized in 2017 as one of "America's Best High Schools" as reported by U.S. News and World Report and as a MICCA Silver winner! Families are welcomed through All School Assemblies, Bingo for Books Nights, Taste of World Cultures, PTO, and School Councils. 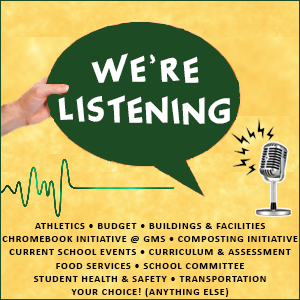 Please visit our site and drop us a line through our “We’re Listening” feature! We love to hear from you! WHAI, Bear Country and Emerson Insurance & Financial Services are celebrating Franklin County Teachers. From now until April 26th you can nominate a teacher, and then each day during Teacher Appreciation Week (May 6th-10th), one teacher will be picked out of the nomination pool to receive special recognition and a gift certificate. Click here to learn how to nominate your favorite teachers! On Tuesday, April 16th, GHS senior Olivia J. threw her 500th-strikeout during a softball game against Mount Everett, which led to a 4-1 win for the Green Wave. On Wednesday, April 10th, Greenfield High School Principal Karin Patenaude, and GHS History teachers, Mr. Martin and Ms. Dodge, presented an overview of the new Civics Curriculum that GPS plans to begin implementing in the 2019-20 School Year. On Thursday, April 4th, Newton School received a $5,000 check donation from Big Y Supermarkets, to put towards repaving their playground basketball court.